PROMISING fly half Luke White has got the ‘ability’ and the ‘attitude’ to be a success at Harlequins, according to Bromsgrove School director of rugby Tony Windo. The 18-year-old has earned an academy contract at the Aviva Premiership club and Windo believes his former pupil is ready to make the ‘massive’ step up to senior rugby. 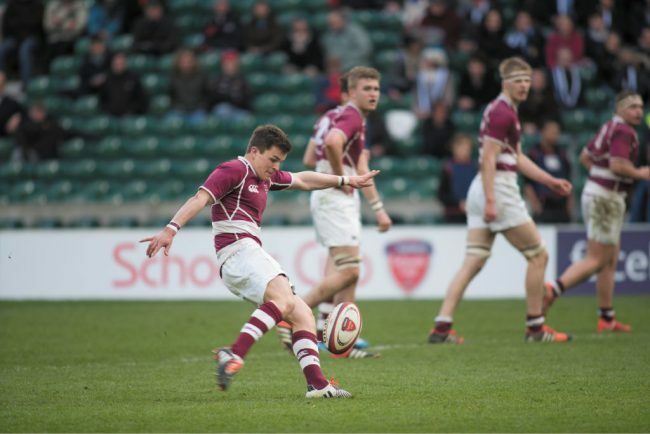 Under the captaincy of White, Bromsgrove School clinched the NatWest Schools Cup for the first time with a 30-18 victory over Dulwich College at Twickenham in March. Following this success, White, who was previously part of Worcester Warriors’ academy, secured a trial at Saracens before Windo asked Quins’ academy manager Tony Diprose to have a look at him. “Saracens’ situation financially changed and there was nothing they could offer him, so I then contacted some good friends at Quins,” Windo said. Last month, White helped Harlequins reach the final of the Singha Premiership Rugby 7s Series before director of rugby Conor O’Shea offered him a deal. And Windo, who played top flight rugby for Worcester Warriors and Gloucester, was confident White would continue to make an impression at Quins and at Dorking where he is dual registered. “Although he achieved a lot with the school last year, I think stepping up into a Premiership academy is massive, so it is going to be a big year for him,” Windo said. “He is a bright lad and his work ethic is exceptional, so he will pick up an awful lot from the people around him. White said he was looking forward to staking his claim at Quins. “I’m delighted to have signed for Harlequins as it is a club with such high calibre players, coaching staff and with such a great team culture,” White added.